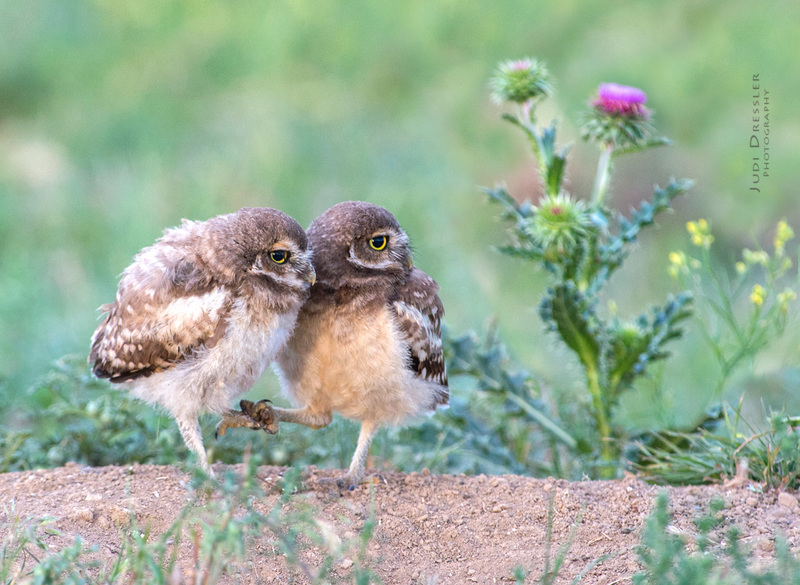 These two baby Burrowing Owls are siblings from the same nest. They are just a few weeks old, and are exploring the world outside the burrow. Mom and dad bring food for them and will for quite some time yet, although they are also just starting to pounce on insects or what might look like an insect on their own. Mom and dad also warn them of any danger, such as hawks or humans, whereupon the owlets run back into the burrow as fast as their little legs will carry them. I photographed this little family a number of times, and just loved watching their antics! Here they are holding hands – I’d like to think it’s because they love each other, but really I think they somehow just got their talons tangled up! Burrowing owls are born underground in burrows, often times these are burrows built by prairie dogs. They hunt crickets, grasshoppers, and other bugs, as well as small mammals such as mice, and small reptiles. This photo was taken near Greeley, Colorado, on July 16th, 2017.